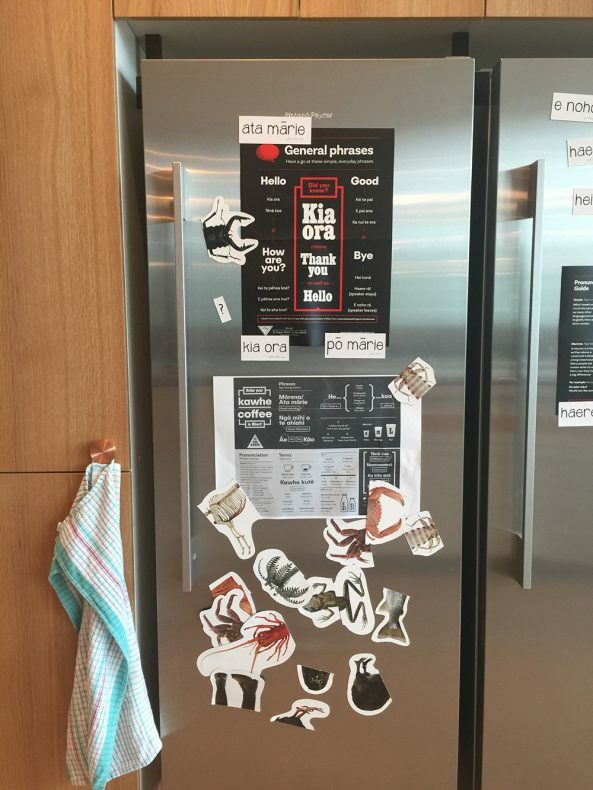 Te Papa is always looking for creative ways to promote te reo Māori. What are some of the ways we’re doing that? How’s the whānau? What’s your favourite kai? Can you count to tekau? Some New Zealanders use Māori kupu in everyday conversation, dropping Māori words into English. If that’s you, then you’re talking what Te Papa’s Writing Team calls te reo Kiwi. Ka pai. But a lot of Kiwis still don’t know much Māori beyond ‘kia ora’. At Te Papa, we aim to change that. A big challenge, but we reckon the mahi we’re doing around bilingualism is making a difference. All the text has been bilingual in our recent exhibitions, such as Rugby Legends and Peter Snell: Medal-Winning Magic. 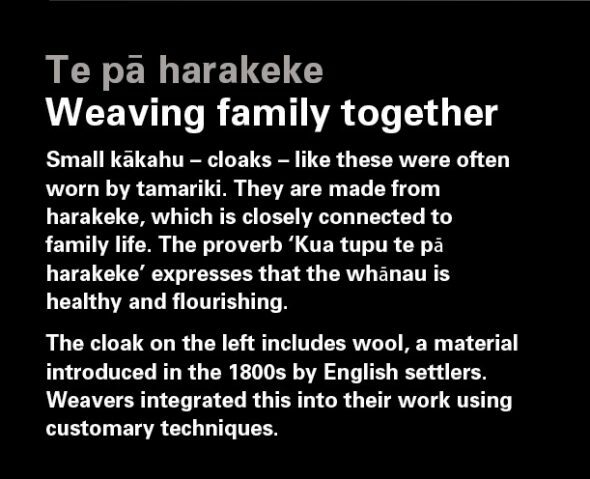 When our new art galleries open next year, you’ll see both English and Māori across every exhibition. 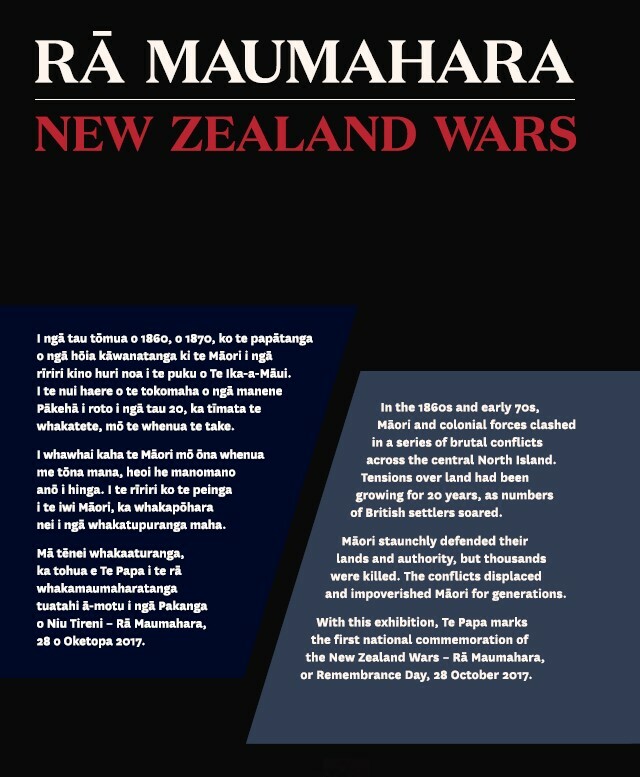 This label is from Rā Maumahara: New Zealand Wars, currently on display. 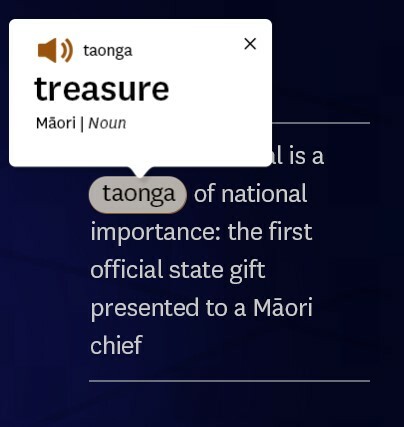 This kind of text, for fluent speakers of Māori, will always be important at Te Papa. But we also want to support all Kiwis keen to boost their Māori vocab. Digital technology creates some great learning opportunities. 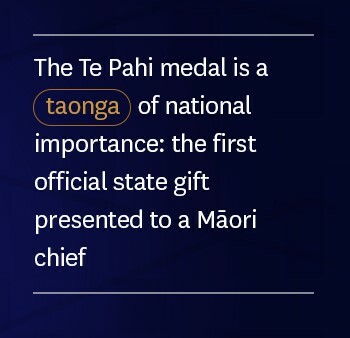 Look at this sentence (below) from the screen next to the Te Pahi medal display. See how the word ‘taonga’ is outlined and a different colour? Tap on it, and you get a translation of the kupu. Even better, you can hear it spoken, and have a go at saying it yourself. We’re also experimenting with low-tech ways of introducing more kupu around the museum. This is a printed sign we put on things like digital screens when they’re not working (a rare event, of course!). There are a few kupu Māori and phrases so familiar to Kiwis that we seldom translate them. These include ‘kia ora’, ‘marae’, and ‘whānau’. 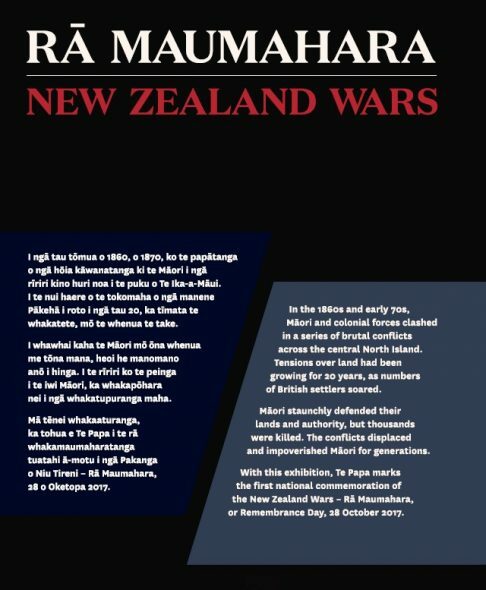 See the bottom line of this label from the iwi exhibition Ko Rongowhakaata: The Story of Light and Shadow. We don’t have fixed rules on how we use te reo Māori – it depends on the context, and what audience we’re writing for. 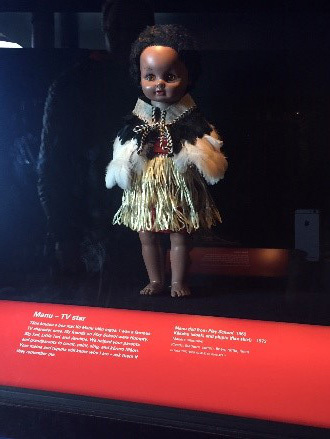 In Te Huka ā Tai, the children’s Discovery Centre with a Māori focus, the Māori is mostly left untranslated. That’s because many tamariki who visit that space already know a lot of Māori. This label from Te Huka ā Tai is a good example of how the languages can work together: te reo Kiwi. Not everything we try works. In this draft label for the Weavers of Wellbeing display, we tried using untranslated Māori words. However, here the audience was older and included many overseas visitors. Feedback indicated that this audience generally didn’t understand words like ‘tamariki’ and ‘harakeke’. Behind the scenes, we’re always learning too. Every time we reach for the miraka in the pouaka makariri, we’re reminded of a few words and phrases we can use every day. Te reo Māori is Aotearoa’s language – nobody else has it. But if we don’t use it, we’ll lose it. You don’t need to be fluent in Māori to keep the language alive. 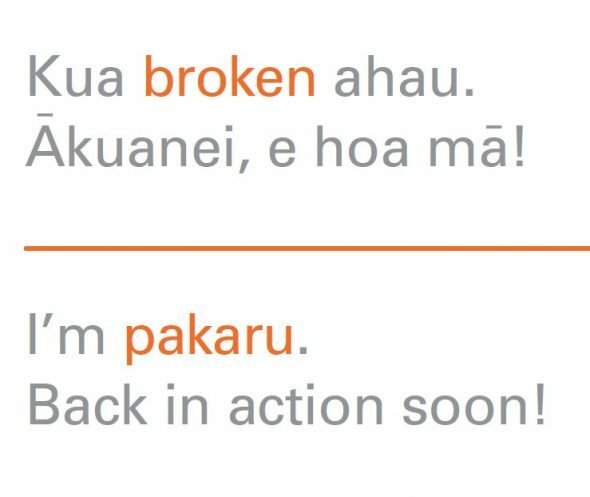 Just keep using te reo Kiwi. Our goal is to keep building a language that reflects our bicultural heritage, represents Aotearoa, and unites us. A language that’s yours, mine, ours. Kia kaha te reo Kiwi! Let’s make the Kiwi language strong! My trainer, Jayne, at the Lincoln Uni gym is Ngai Tahu and we speak te reo Kiwi whenever we are together. I can count to 100! Adding to what I already knew, Jayne has taught me heaps of words and phrases. All over the Recreation Centre (in which the gym is situated) are Te Papa style labels: computer/rorohiko; clock/karaka; gumboots/kamuputu. Thanks for your tākupu, Alison. Sounds like you’re enjoying learning Māori – keep it up! Great that you’re able to speak it with your kaiwhakaako – a great way to learn.